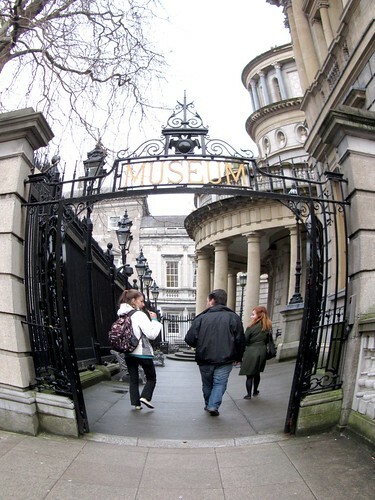 Do you know, many of the museums in Dublin are free to enter? My favourite among all is the Chester Beatty Library at the back of Dublin Castle, of which currently there is an excellent exhibition of the lores of Shahnama and a number of related events have also been organised. Last week, I was at a showing of Azur and Azmar and I’m looking forward to a public lecture next week on The Shahnama and the Iranian Identity. Should be very interesting. This photo above though was that of the entrance to the National Musuem of Ireland-Archaelogy on Kildare St, which houses a large number of artifacts and bog bodies. To its back is the Natural History Museum which recently reopened after a spell of structural repair works. A triumvirate of national museums is formed through inclusion of the National Gallery nearby, whereby these museums surround the Leinster House, current seat of Irish Parliament. There is no admission charge to any of these museums mentioned above. ooooh, that sounds interesting. The Shahnameh is itself a really good read – i downloaded it for free off the interweb last year. Cried all the way home on the train while reading the Tale of Sohrab and Rustam. 0ooo could you please email me the shahnameh? i’ve been thinking of reading it. ta! there’s public donation, government funding, “friends of museum” scheme, etc. occasionally, wealthy folks also include donation in their wills.